A compact active monitor for high-quality listening at low-to-medium sound levels. 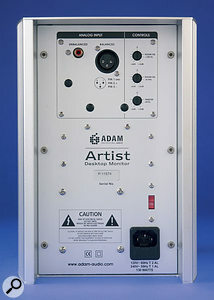 The monitor under review here is a relatively small, two-way active monitor designed for use with desktop audio systems, but unlike most multimedia desktop speakers, which are anything but accurate reference sources, the Artists use the same technology as in ADAM's larger studio monitors to deliver studio monitor performance in environments where conventional monitors would be too large. Like ADAM's larger monitors, the Artist uses ADAM's own folded-ribbon tweeter to handle frequencies above the 2.2kHz crossover point, while a 5.5-inch foam-sandwich-cone woofer takes care of the bass and mid-range. 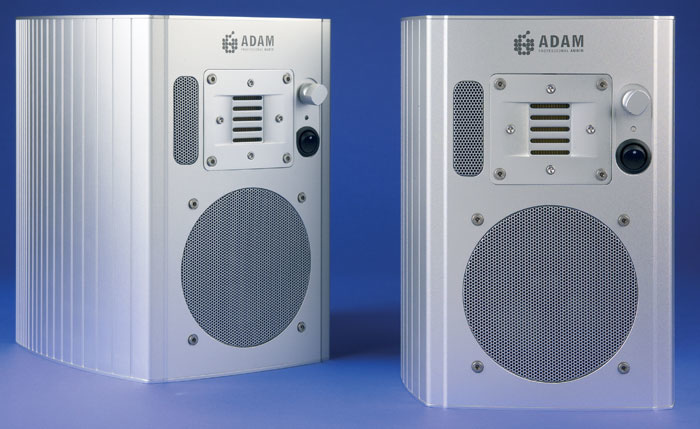 Because the ADAM ribbon tweeters work up to very high frequencies, the overall frequency response extends from 52Hz right up to 35kHz (±3dB) with a maximum SPL capacity of 102dB at one metre. This level is somewhat less than you'd expect from a large studio monitor, but still adequately loud for comfortable (and safe) sustained monitoring at close quarters. For more details on the technology behind the ADAM ART folded-ribbon tweeter, refer to our review of the ADAM ANF10 monitors back in SOS November 2004. Measuring 190 x 250 x 218mm, the cabinets have something of a consumer hi-fi look to them, but rather than being made from the silvered plastic that's so common in such circles, they are in fact fabricated from thick aluminium and weigh a substantial 8kg each. Inside each cabinet is a pair of 50W power amplifiers (80W peak capacity) fed from an integral active crossover. A rocker power switch and rotary volume control are easily accessible on the front panel, while the rear panel houses a balanced XLR input (but oddly no balanced jack input), an unbalanced phono input, and three screwdriver-adjustable controls. The first two controls are described as Room EQ. The first has a range of ±6dB at 150Hz and below, while the second has the same range but operating at 6kHz and above. These provide EQ 'tilt' rather than shelving characteristics. A third control adjusts the tweeter level relative to the woofer over a ±4dB range. By default these are all set to their flat positions. A recessed voltage selector allows 230V or 115V operation and power comes in via the familiar IEC socket. There's considerable overhang at the rear of the cabinet to hide and protect the connections and controls, and there's a threaded standmounting insert in the base. At modest volumes, these little monitors are surprisingly tight and punchy, with an open, detailed top end and a bass end that's fuller and tighter than expected. In my own studio I didn't need to adjust the rear-panel controls to get a decent tonal balance, though the overall character might best be described as just on the forward side of neutral — which is often preferred for tracking. The stereo imaging is extraordinarily good, with a very believable phantom centre image, and the sweet spot is sensibly wide too. They're very critical of MP3 or AC2 compressed recording, but then this could be an advantage if you're producing music in these formats, as you're left in no doubt as to what the shortcomings of data compression are, especially when it comes to top-end brashness! There's so much air blasted out of the reflex ports at normal operating levels that a pair of these speakers could make a practical alternative to studio air conditioning, but what they seem to lack is any form of limiting or clip warning, so the sound goes straight from clean and wonderful to 'hitting the end stops' crunch distortion as you crank up the level. At normal working levels they're fine, but there comes a time in every mix when you want to wind up the level a bit, just to see how the balance hangs together, and that's where the Artists fall down — they just don't have the power in reserve to do that, but then this is a small speaker and you can't buck the laws of physics. Used within their intended volume range, the Artists deliver a very detailed sound balanced by a comfortably solid low end and good mid-range accuracy. ADAM's ribbon technology really is exceptionally good, which is why the upper mid-range and high frequencies are so transparent. The Artists seem close to ideal for low-level to medium-level work in confined spaces, and come in at several quality levels above what you expect from a desktop speaker, but they aren't designed to be used as high-level studio monitors and they fall down badly if you try to use them as such. I'm quite happy to accept this limitation, as it's inherent in any small design, where the choices are invariably between quality and quantity, but I do feel that a clip-warning LED should have been provided on the front panel, as short periods of clipping could easily be overlooked, especially after long sessions. When it comes to cost, the performance at comfortable sound levels certainly warrants the UK selling price, but only if you don't need to monitor more loudly. In this respect, the outside-broadcast and edit-suite applications seem more in line with their performance than routine studio work, where the odd spell of 'vigorous' monitoring is par for the course. If you don't need a compact desktop monitor, then there are lots of ways to spend your money that will deliver adequate sound quality at a much higher SPL, but if your need meets what the ADAM Artists have to offer in terms of size and playback level, then I think you'll be very pleased at the audio quality they can deliver. Detailed sound with excellent imaging and solid low end. No clip-warning LED or safety limiter. The Artists are designed to bring ADAM monitor quality to a market that needs smaller systems and where high-SPL listening isn't required. In this respect they succeed admirably. £843.66 per pair including VAT.